Epcot’s Festival of the Arts will return on January 18 and run through February 25, 2019. 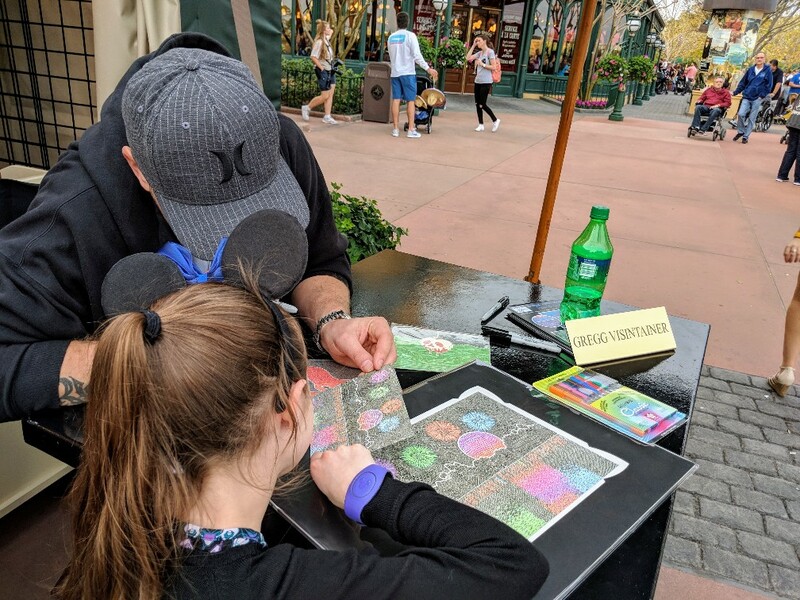 Although a relatively new offering at Disney World Epcot Festival of the Arts is becoming a very popular event. 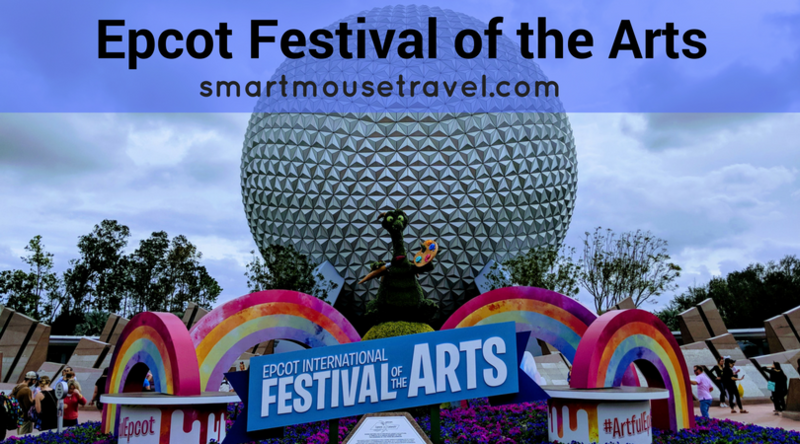 Billed as a celebration of art, Epcot’s Festival of the Arts highlights traditional art, culinary arts, and performing arts with several different offerings in each. 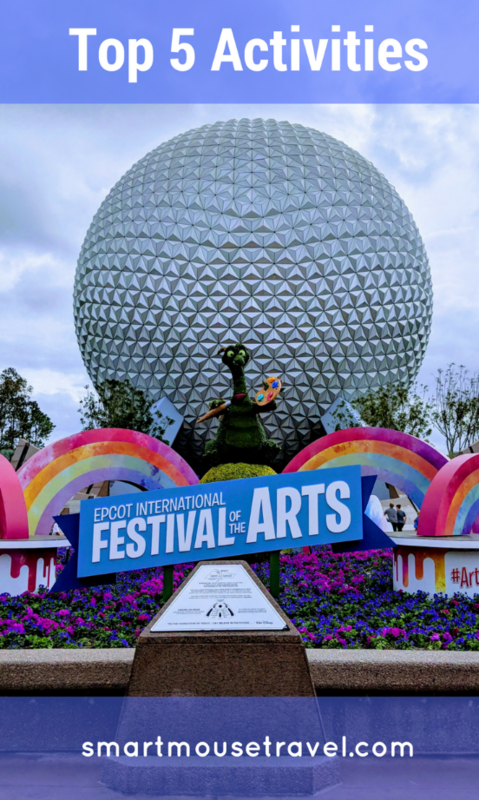 Here are the 5 activities we loved best (in no particular order) at the Epcot Festival of the Arts. The Hands-on wall mural (previously known as Expression Section) is just inside World Showcase when walking toward Canada. 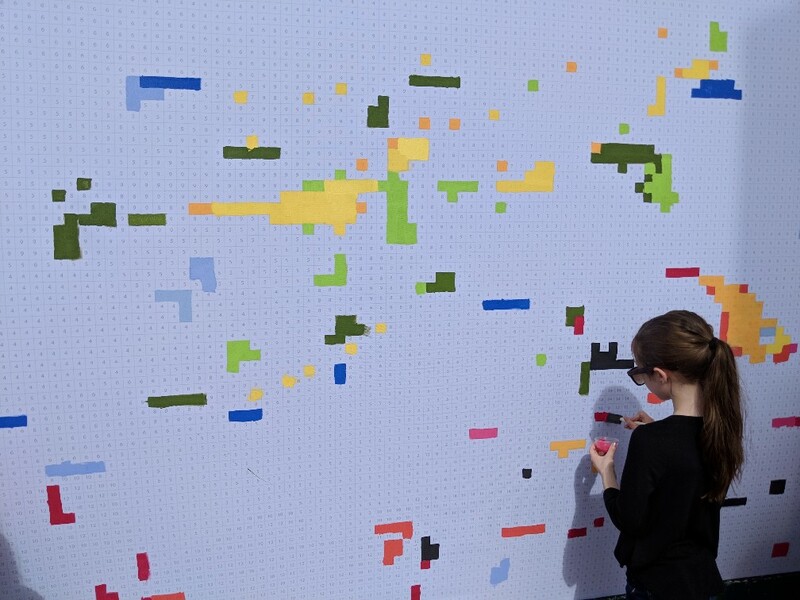 All Epcot guests can be part of an immense paint by number mural that changes about every two days. A cast member will provide you a foam paint brush and a small container of paint with a number written on top. Find your number on the mural and then use these painting supplies to paint the number of squares the cast member tells you. We got to paint 5 squares each during our visits. We were lucky enough to participate twice. On Saturday afternoon we were some of the last people to finish a monorail painting. Sunday morning before leaving for the airport we got to start a new mural of Figment under the sea! After painting your squares you will be given a postcard which shows the inspiration for the finished masterpiece! 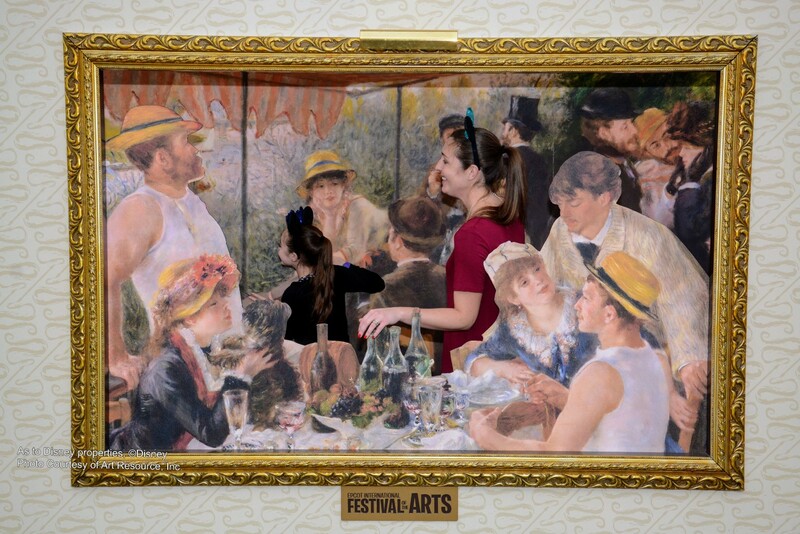 Have you ever dreamed of being in a famous painting? During the Epcot Festival of the Arts this dream can come true. Several famous paintings can be found around World Showcase, and you get to be the star. The photo spots are set up to look like a painting on a gallery wall complete with frames and art lamps. You enter the picture (you stand between a background and foreground) and then pose any way you like. Look for inspiration from the informational sign about the original art or be as silly as you want. We loved this artful photo option so much that we did them all! Do you love Broadway musicals? Then add this to your list at the Epcot Festival of the Arts. Each night during the festival, stars of Broadway take the stage three times a night to perform some of your favorite Disney on Broadway songs. The concert takes place in the America Gardens Theater in World Showcase. Seating is first come, first served if you have not purchased a dining package for reserved seating. We walked up right before the show started and stood behind the seating of the theater. Even though we were not inside the theater we could hear and see the show well because we were the first people behind the roped off area. We heard songs from Lion King, The Little Mermaid, Aida, Tarzan, and Aladdin. The singers and live band put on a great show! Fine art booths are found all around World Showcase during the Epcot Festival of the Arts. Each booth highlights art for sale by a few different artists. The art pieces range from very expensive originals and quality reprintings to items like postcards which were very inexpensive. Elizabeth was drawn to this cool image of Epcot that when inspected closely has tons of hidden detail in the drawing. After purchasing a postcard version of the image we were able to meet the artist, Gregg Visintainer. Gregg autographed the postcard and even pointed out some of the extra hidden items we had not discovered in the picture. It was such a unique experience to meet and talk to the artist. Epcot’s Festival of the Arts also celebrates the culinary arts . With Elizabeth’s food allergy the food booths at Food and Wine have often proved difficult. We have struggled to get accurate information and many items are unsafe. This festival was somewhat easier. Staff at the register will contact a chef regarding food allergy concerns. 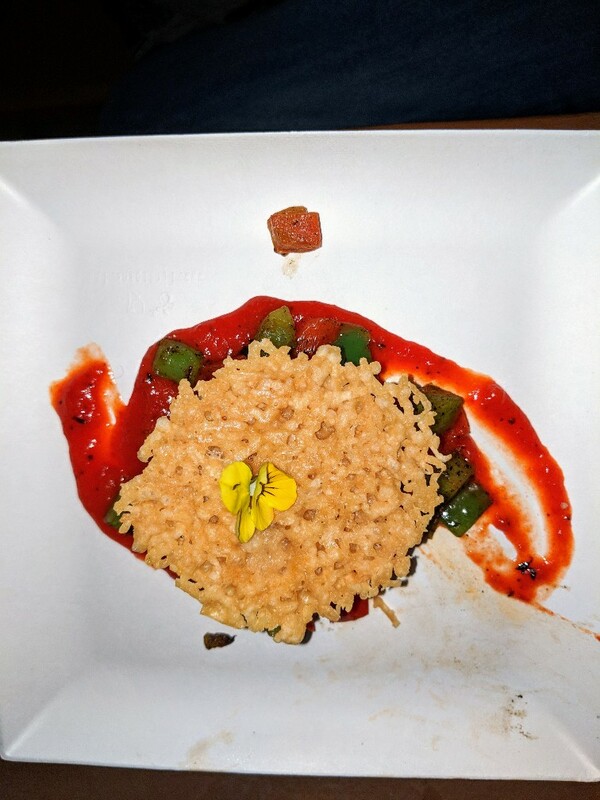 Sometimes a dish can be modified at the booth if cross-contamination is not a concern. Callebaut Belgian Sipping Chocolate: Dark Chocolate with Chambord (this one had alcohol so it was all mine!) In 2019 there is a sipping chocolate flight instead of this exact item. 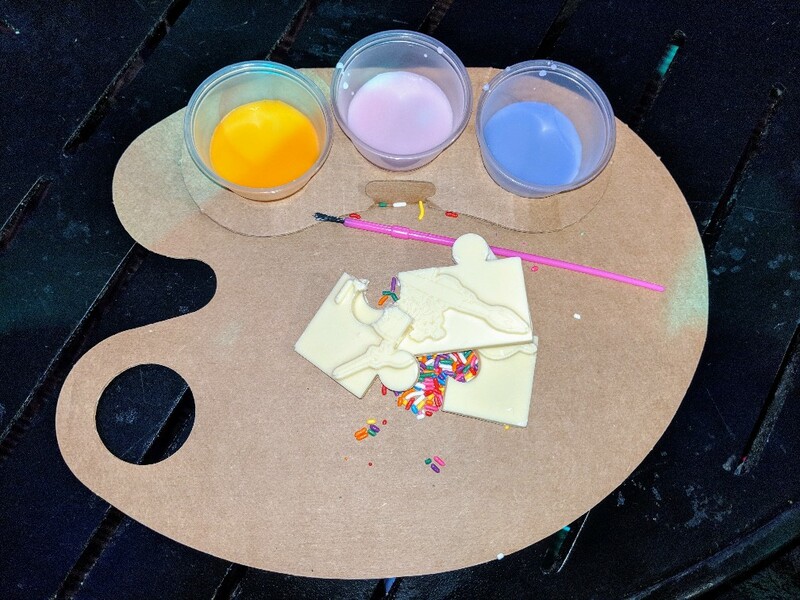 The Figment white chocolate puzzle was a huge hit with Elizabeth since you are encouraged to play with your food! The puzzle comes on a small cardboard palate with frosting “paint” and a paintbrush. She put the puzzle together, painted it, and then gobbled up every bite (except for a teeny-tiny corner I begged to taste). We really loved Epcot’s Festival of the Arts. In fact, we opted to do so many festival activities that we did do not much else during this visit to Epcot. 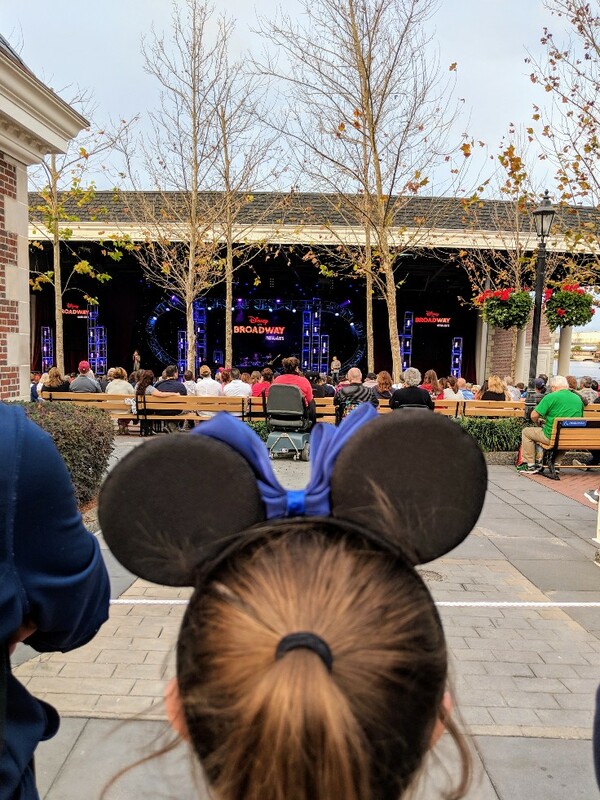 The Disney on Broadway Concert series, artful photo opportunities, the chance to paint part of a huge mural at Expression Section, the opportunity to meet artists, and eat beautifully delicious food made our trip extra special. 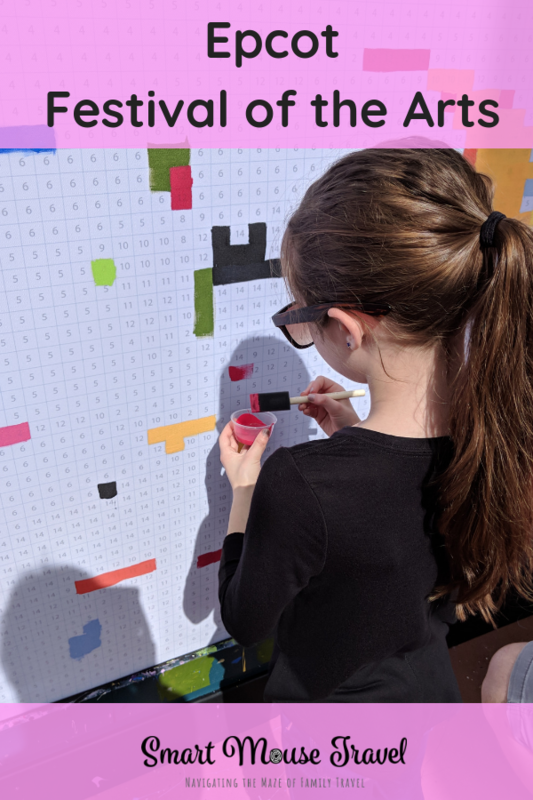 There are even more art inspired activities during the festival that we didn’t get to do. 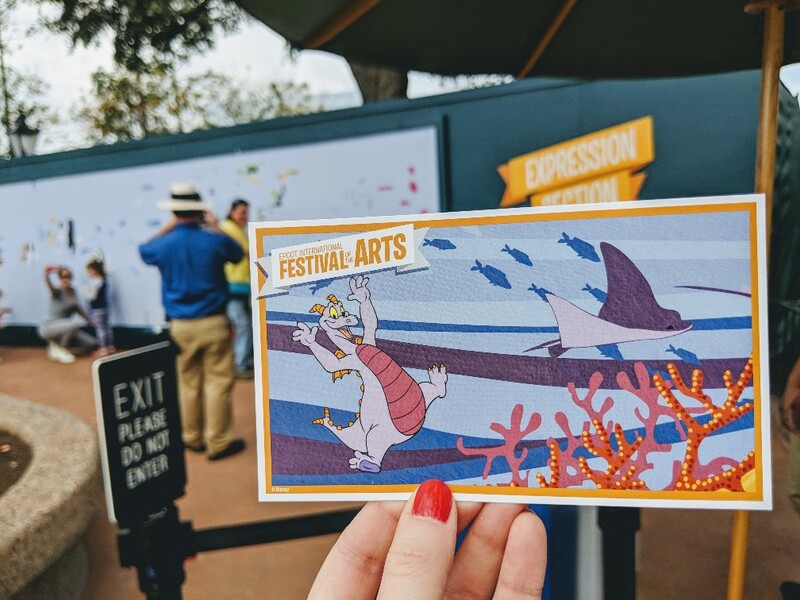 We highly recommend you take a little time to enjoy the arts during the 2019 Epcot Festival of the Arts which runs January 18 through February 25, 2019.